Sunday’s French Open final was an absolute mess. Novak Djokovic and Rafael Nadal, meeting in the championship round of a Grand Slam for the fourth straight time, fought delays, poor conditions, and their own sporadic play in a match that lacked their usual high quality. Rafa took the first set 6-4 despite losing a 3-0 lead, and won a sloppy second set, 6-3. After a long rain delay, he took a 2-0 lead in the third, and it looked like he might finish the tournament without losing a set. But the rain had taken a toll, and a huge momentum swing was in the works. Djokovic began playing his usual attacking style, hitting deep returns and dictating play with powerful forehands. Nadal’s topspin, so effective at Roland Garros because of the high bounce it takes on clay, was nullified by the heavy balls and wet court. Djokovic won the next eight games, an unprecedented losing streak for Nadal on his favorite surface. And in a rare departure from his fierce on-court demeanor, he began to get frustrated. When Djokovic broke him to start the fourth set, he took one of the soggy balls and angrily threw it at (or toward) tournament referee Stefan Fransen. He was in a bad place, and he knew it. The six-time champ, trying to top Björn Borg for the most French titles of all time, wanted nothing more than to get the hell off the court before all was lost. Lucky for him, the rain increased and the match was postponed for the night. Djokovic had history at stake, too — a fourth straight Grand Slam, a feat not accomplished since Rod Laver — and he had his own bout of anger early in the match, when he smashed his racket against the Perrier sign beneath his seat, sending shards flying onto the clay. Both players left the court full of frustration and nerves, doomed to wait another night to see an end to the match. Play resumed Monday, and Rafa started it off with a service break to even the fourth set at 2-2. The rain came in drizzles, but the court conditions were better. Nadal’s ball was hopping, and his tactics were more aggressive. Novak lagged just slightly, hitting himself in the head with his racket after a bad error during the first game. When Nadal’s shot hit the net and trickled over at 30-40, leading to an easy winner and the break, it was clear the weather — and the luck — had shifted back in his favor. But a critical facet of Djokovic’s success over the past two years, as he’s captured four of six Grand Slam titles, has been his spectacular play under pressure. Yes, his game is superlative, but none of the major championships came easy (except, perhaps, Wimbledon). He survived two semifinals against Roger Federer in 2011, including the U.S. Open epic when he saved two match points on Federer’s serve. Then, this year in Australia, he fought for nearly six hours before beating Nadal 7-5 in the fifth set. His clutch play continued in Roland Garros, when he saved four match points against Jo-Wilfried Tsonga in front of a partisan French crowd to advance to the semifinals. The point is, he’s dangerous when cornered. As the momentum swung back to Nadal, Djokovic’s intensity redoubled. He committed to a fearless style, hitting lines and going for winners as he pushed his opponent back. Whenever Nadal became timid, which does happen at odd intervals, Djokovic controlled and won the point. On both days, you could see Rafa reminding himself over and over that playing defense was not enough; he had to attack as well. He did, and the result this morning was the spectacular competition we’ve come to expect. “The battle is beautifully joined,” Mary Carillo said, and she was right. The rain increased, leading to a short delay, but then the sun came out. You got the sense that Rafa had to win the fourth set or he’d be subject to the same unfavorable conditions he faced a day earlier, with the same results. At 6-5, 30-all, with Djokovic serving, he smashed three beautiful forehands in a row, finally winning to give himself a match point. And then the great Serbian, who had been so unfailingly tough for two weeks — no, two years — finally showed the slightest crack. His first serve went long, and his second did the same. What this victory meant to Nadal, after three straight Grand Slam losses to Djokovic, could be felt in the aftermath. After collapsing to the clay, he jumped into the stands to embrace his tearful family, his uncle Toni, and even Pau Gasol. It’s easy to forget, considering his 52-1 record in Paris, but Novak Djokovic briefly overtook Nadal as the best player on clay last year. In the 2011 finals in Madrid and Rome, it was Djokovic who prevailed, and only a semifinal loss to Federer prevented what could well have been a monumental victory over Nadal at the French final. 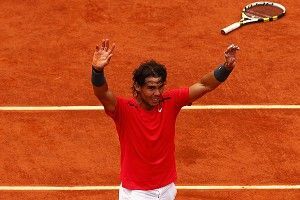 But the resurrection has been quelled; with wins over Novak at Monte Carlo, Rome, and now Paris in 2012, the king of clay is back. And that’s just the start. I wrote in late April about Rafa’s “second mountain” — his attempt to figure out Djokovic after he finally conquered the invincible Federer at Wimbledon in 2008. Taking back clay was the first and easiest step. Now it’s on to the harder surfaces, where he keeps getting closer to his rival after the Wimbledon drubbing; four sets in New York, five sets in Melbourne. Watching the world’s best player try to hold off the world’s most relentless is the absorbing narrative of 2012. I wouldn’t bet against either one.